Barcelona is a city that faces the sea, with almost five kilometres of beaches from Sant Sebastià to Llevant. All of them have facilities for bathers and lots of them have places for playing sports like table tennis and volleyball. The city’s green lung, a privileged location within reach of Barcelona’s residents. More than 8,000 hectares of natural space, dominated by woodland of great biological diversity. An essential visit, Montjuïc Park occupies most of the hill overlooking the port, and it is full of green areas and gardens, museums and cultural facilities, sports facilities and Olympic installations. Montjuïc tells us about the history and life of a mountain that has marked Barcelona's personality. This natural park consists of 9 kilometres of the Besòs River, from its confluence with the Ripoll River to the sea. It is one of the most important natural areas in Barcelona's metropolitan area and it is a great place for a stroll or for cycling. The city of Barcelona is located at a strategic geographical point on the Mediterranean coast of the Iberian peninsula, protected by the Serra de Collserola mountain range, delimited by two river deltas and with privileged natural surroundings. This has given rise to its sustainable growth: the city has become a grand European metropolis that is integrated into its surroundings. Barcelona has prospered on slightly inclined land that extends between two deltas, those of the Besòs River, to the north-east, and the Llobregat River, to the south-east, which is separated from the city by Montjuïc Mountain, rising 184 metres above sea level and forming one of the city's largest garden areas. The city is also protected by the Serra de Collserola mountain range, which covers 8,000 hectares at the city's rear. This extensive green area was declared a natural park in 2010, and its highest point is Tibidabo Mountain, at an altitude of 516 metres. There are seventurons, or hills, in the upper part of the city, namely Peira, Carmel, Rovira, Creueta del Coll, Putxet, Monterols and Modolell. These hills, which have all been urbanised, have become green areas that have wonderful views of the city. 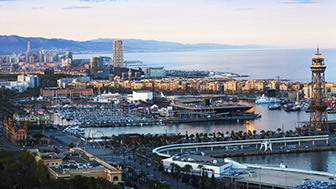 The city's four kilometres of beaches with safe, calm, warm waters have made Barcelona a unique place for enjoying the sea and water sports. Meanwhile, the city has one of the most active, important ports in the Mediterranean, which acts as a gateway to Europe for goods coming from Asia, Africa and other parts of the world. The city extends outwards to its metropolitan area, forming a concentrated urban network that makes it the sixth most-populated city in the European Union. 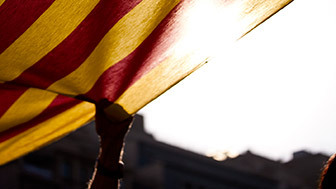 It is the capital of Catalonia, one of Spain's 17 autonomous communities, and the second biggest Spanish municipality in terms of population, only exceeded by the Spanish capital, Madrid. 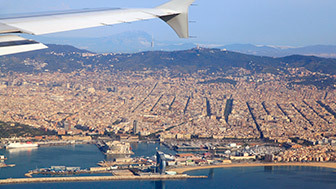 A major economic driving force and a strategic city for the transportation of people and goods, Barcelona also has an international airport that connects it to all five continents.